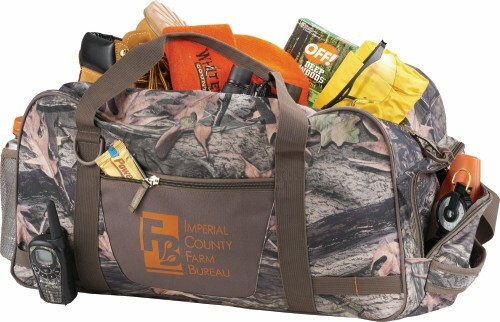 For the hunter within, this camouflage 22" duffel is great for your gear while traveling, no matter where your travel takes you. Quiet, brushed polyester ensures you won't be heard in the woods, while the size makes it perfect for traveling as a carry-on. Side zippered pockets and mesh exterior side pocket make sure access is quick and easy. Exterior webbing, embroidered branding on the handles, and large front zippered pocket add additional finishing touches to this bag.